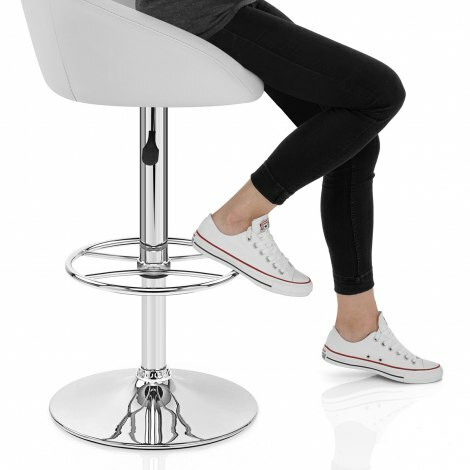 The Zenith Bar Stool White is a stylish item of furniture with an immensely comfortable and supportive design. Crafted with strength and style, the Zenith Bar Stool has a modern sense of glamour that will bring a luxurious touch to your interior. The accommodating seat is covered in its entirety with white real leather, above high density foam padding that gives superb comfort. The rear of the seat has a supportive, mid height backrest that wraps around and doubles as armrests, making this a very relaxing place to sit. The seat is affixed to a central chromed column, which houses the gas lift mechanism and circular, hand crafted footrest. The gas lift allows you to adjust the height as well as turn through 360 degrees, making access to any bar table or counter all the easier. Finishing off the package is the round base, which has a rubber ring underneath designed to help keep your floors free from scratches. "Good quality, very comfortable and looks great"
Very pleased with the two stools I purchased for my new kitchen. Delivery was withIn a week even though I live in the north east of Scotland. The stools are of a very good quality for an excellent price and they were very easy to assemble. I would not hesitate shopping with Atlantic in the future. Excellent stools, well made and actually relatively light. Very comfortable to sit on. Atlantic were very efficient at delivery and I would recommend these stools. Good value for money. Good quality, very comfortable and looks great.